We all know that there are many intangibles that influence success, but I’ve found that one of the most important is trust. Earning the trust of your client comes from offering value, keeping your word, and being responsive. Lack of trust is like a ‘tax’ on the business relationship. Speed decreases and cost increases due to the additional justification and due diligence that is required to compensate for the lack of trust. Everything is easier with trust – this is why testimonials are so important to get your foot in the door. Long-term clients are created when you build and maintain that trust. A personal example that I immediately thought of is something that I am still amazed by today. It has to do with a FedEx package and their promise to deliver when they committed. Last Christmas I procrastinated and ordered the perfect gift for my daughter online. Although I was cutting it close, FedEx promised it would be delivered by Christmas Eve. That’s all I needed! Well, the day came, all the other packages were under the tree, and the one key present still had not arrived by noon, 3:00 pm, then 6:00 pm. As you can imagine, I pretty much gave up. We went on with our family’s traditional celebration. But to my complete surprise, the FedEx truck pulled up at 9:00 pm with the package! Now I know the landslide of deliveries that FedEx has during the holidays, so I was willing to cut them some slack. However, I’m now an even bigger fan. This epitomizes how long-term customer loyalty often is won in the save-the-day moments like these, where our trust is rewarded with action. Now something more relevant. In recent blog posts in both January and February we talked about the importance of choosing the right partner. This of course is closely tied to a foundation of trust. One of our key partners had a big problem in which our trusted partnership successfully enabled us to help them in a big way. On the night of February 7, 2008, an explosion and fire completely destroyed Imperial Sugar’s Savannah packaging facility, taking 14 lives and 60% of Imperial’s production capacity with it. The facility was offline for nearly 18 months. Imperial needed immediate insight into how many customers it could serve with its available inventory. We worked hand-in-hand with them to ensure that the forecasting software and data were properly configured so that they had an accurate overview by product line. This allowed them to uphold their “availability to promise” because everyone from production to sales could see, in real time, what could be delivered. Speed was required, and an established, trusted partnership was a critical component to their success, as they later stated in CIO Magazine, “Supply Chain Management to the Rescue”. I can’t finish a post on trust without referencing the person we learned about in grade school who knows a little bit about honesty–Abraham Lincoln. One of my favorite quotes of his is, “The truth is your best friend”. How true and how important it is in successful business relationships. groundhog. My personal tie to Groundhog Day is much closer to the 1993 comedy starring Bill Murray. But behind the fun and festivities lie some somber statistics. 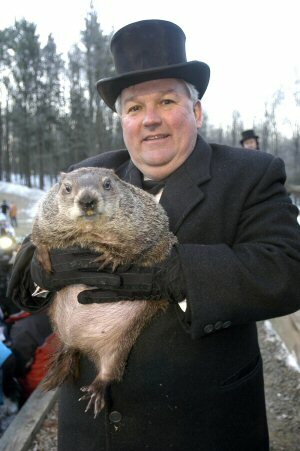 According to the StormFax Weather Almanac and records kept since 1887, Punxsutawney Phil’s weather predictions have been correct only 39% of the time. Industry hopes to do much better with forecast accuracy than 39%. Statistical models are invaluable in building confidence and success for companies struggling to compete in the global marketplace and vie for the dollars of a customer in a recession squeeze. So many factors are out-of-control for the executive today, who deals not only with weather disruptions from the statistical norm, but many other outside factors: loss of revenue channels, bad relationships and impacts from other links in the supply chain, and a lack of supply chain talent in their own organizations. Executives then look inward to best practice technologies to attain the best possible supply chain results possible and thereby to weather the storm. As supply chain technology evolves, the better tools move beyond statistics, and with neural networking can learn as they go, drawing from sources like their customers’ POS data, current market share, and unemployment figures. They take the team to the next level of maturity, still accepting the input of the professionals, but not leaving any available external information on the table. Superstition, if you want to call it that, can block progress when management does not want to relinquish control of the data to the powerful new methodology, and defeats the purpose of investment and training in the tools that were there to help in the first place. The best S&OP software will have the transparency and ease-of-use to allow the whole organization to overcome those fears. It will be backed with dedicated education and training to make it quickly become a part of the company culture. Superstition can also divert selection of best-of-breed software to large enterprise software, with a feeling of safety that the larger and more all-encompassing the software, the better. It may feel like a safer, easier, and less controversial choice. It may have a weaker forecasting engine than other best-of-breed software. It is less work in the short run of the procurement process, but also offers far less gains in the long run of the lifetime of the supply chain. Without powerful forecasting, businesses can still rely on operational improvements to guard against supply chain losses: adding supplier diversity, forming alliances with like businesses to fill holes when inventory predictions come up short, using local supply chains for local demand, and consolidating distribution centers. But imagine the power of combining all of these far more costly operational improvements with the software that provides the best forecasting accuracy available on the market. Another relative of Punxsutawney Phil’s is Gnocchi the Squirrel, who by virtue of eating more peanuts out of a Romney bowl than an Obama bowl, predicted a win for Romney last November. More superstition. Demand Foresight uses innovative technology that is unlike any on the market, and partners with your company to take your forecasting accuracy out of the shadows! This blog is all about exploring the importance of reducing forecast error. It also explores the measurable impacts of achieving that reduction in error. We have explored certain details like impacts on working capital, customer service and production efficiency. We have pulled back and also discussed the more strategic bigger picture components of using forecast accuracy to drive important processes like sales and operations planning and financial reporting within the context of Sarbanes-Oxley. However, I think we have been consistent that ultimately, improving forecasting is the first step in a long process of maximizing profitability and shareholder and stakeholder value. The more forecast error a company (either private or public) accommodates or allows to exist within its value chain, the less valuable the company will be. Unfortunately, this lesson has been brutally reinforced through recent reporting about Apple. It was revealed that Apple had dramatically cut orders for iPhone components. It was reported that this was primarily because demand was softer than expected. In other words, the forecast was way off – it contained a lot of error. The result – an immediate 4% drop in the stock price worth billions of dollars. Reducing forecasting error should be, consistently, one of the top 3 strategic initiatives of every leadership team of every for-profit company. Solving business problems and helping our partners create future profits – Demand Foresight is completely focused on these goals. We focus on delivering upon these through improving demand planning and overall S&OP operations and helping support transition to being a demand driven company. Our experience in this work helps us quantify the impact of what we do – a minimum 5% improvement in pre-tax profitability. But obviously we are not the only game in town and there is a tremendous body of work around demand forecasting and the impact of improving the forecast on various components of the supply/value chain. It was brought up that we had never really highlighted some of this research so we went back and took a look at some of the source inspiration for our focus. I hope you find this of value. First up is Dr. Hau Lee. He is the Thoma Professor of Operations, Information, and Technology at Stanford University; Co director of The Stanford Global Supply Chain Management Forum; Director of Managing Your Supply Chain for Global Competitiveness Executive Program. Dr. Lee’s signature idea is the “bullwhip effect,” a concept he co-developed in the 1990s, which has become a basic tenet in both academia and industry. When a person cracks a bullwhip, the small movements at the wrist produce huge waves at the other end of the whip, which describes how information on demand becomes increasingly exaggerated and distorted as it moves up the supply chain from customer to manufacturer to supplier, driving up costs and hurting efficiency. Next up is Dr. John Mentzer. Dr. John T. (Tom) Mentzer was the Harry J. and Vivienne R. Bruce Chair of Excellence in Business in the Department of Marketing, Logistics and Transportation at the University of Tennessee. He was a prolific researcher and author with 5 books on value chain excellence and competitive differentiation not to mention hundreds of articles to his name. One of his key areas of research highlighted competitive differentiation and included was a fairly definitive summary of what it took to develop a competitive differentiation in demand forecasting and demand planning. Lastly, we referred to our friends at Garter which includes the recently merged business/supply chain analysts from AMR Research. There are a host of strong practitioners such as Noha Tohamy, Tim Payne, Mike Griswold, Dennis Gaughin, and Steve Steurterman just to name a few. Since January 2011 they have published a large number of research papers and articles that highlight the impact of improved demand forecasting. Unfortunately here we cannot include the source documentation links as that goes against policy and legal agreements, but please feel free to contact Gartner directly (www.gartner.com). As they are a potentially important source of information for companies looking to make strategic investments in demand forecasting, sales and operations planning, and demand driven supply chains and networks. Relevant to this blog post, their cumulative research has pointed to some significant findings. Independent of Demand Foresight and its experiences working with it partners, there is great research ongoing that undeniably highlights the benefits of focusing on improving demand forecasting and demand planning. However, one consistent anomaly (kind of an oxymoron – A consistent anomaly?) that we notice is that while this highlighted research above as well as others all emphasize the importance of demand forecasting and measure the benefits of improved demand planning, very few of them talk about specific impacts based on higher percentages of accuracy. Our suggestion and potential contribution to the field is what is the impact of improving accuracy by 5%? 10%? Or as we ask all of our partners and potential partners – what would a minimum 25% reduction in forecast error mean to your bottom line? Judging from our experience and the research– a huge amount!